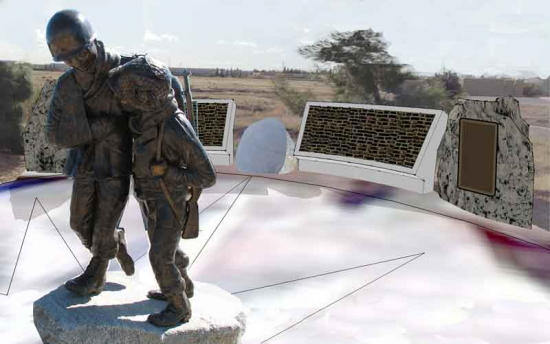 A rendering of the completed monument. ROSEVILLE — Placer County JACL will hold a formal dedication ceremony to unveil a memorial honoring the Nikkei World War II veterans on Sunday, June 2, at 2 p.m. at the Bill Santucci Justice Center, 10820 Justice Center Dr., Roseville. The ceremony will mark a significant step in the four-year effort to construct a memorial dedicated to both those who served in the 100th Infantry Battalion, 442nd Regimental Combat Team and Military Intelligence Service as well as those incarcerated during the war. The first phase, which included a plaque describing the Nisei soldiers’ accomplishments, was dedicated in December 2009 with veterans and the Placer County Board of Supervisors in attendance. A bronze statue titled “Rescue of the Lost Battalion,” designed by local artist France Borka and created by Sacramento sculptor Ronnie Frostad, was unveiled in October 2012. The larger than life-size statue, which depicts a Nisei soldier helping a wounded Texan soldier, is based on the 442nd’s rescue of 211 men of the 141st Texas Regiment who were trapped behind enemy lines in France’s Vosges Mountains in October 1944. The 442nd suffered heavy casualties — 216 dead and more than 856 wounded — in the 34-day Vosges campaign, which also included the liberation of the towns of Biffontaine and Bruyeres. Under the leadership of project chairman E. Ken Tokutomi, the Placer County JACL has raised more than $200,000 for the project, close to the goal of $220,000. Major donors include the City of Roseville, Placer County, and Placer Buddhist Church. As the project has progressed, additional expenses came up, including protective sealer for the monument and a concrete base for the commemorative bricks. The monument will also feature engravings with the names of 148 veterans who resided in Placer County before and/or after the war — only 11 of whom were still living as of February — as well as two polished granite benches to honor the late George Yonehiro, a 442nd veteran and Placer County Superior Court judge, and major donors to the project.